1. 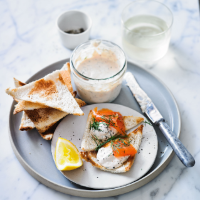 Put the hot smoked trout fillets, crème fraîche, double cream, horseradish, lemon juice and dill into a food processor, and pulse until the mixture forms a smooth pâté, but still with some texture. Season and add more lemon juice if necessary. Cover and chill until needed. 2. Preheat the grill to high. Toast the slices of bread lightly on both sides. 3. Using a bread knife, cut the crusts off the toasted bread. Then, holding the toast flat against a board, slide the knife between the toasted edges to split the bread horizontally. Cut each slice into 2 triangles. Return these to the grill, untoasted sides up, and toast for a further 1 minute until golden and the edges have curled slightly. 4. To serve, spoon a little of the pâté onto each piece of toast, then top with a few of the smoked trout strips. Garnish with dill and lemon pieces. Serve with salad leaves for a more substantial meal. This recipe was first published in Thu May 25 15:45:00 BST 2017.